He is a graduate of the English School, Nicosia and has studied Mathematics and Computer Science (BSc) at the University of Keele in the UK (1988-1991). He completed his postgraduate studies in Business Administration (MBA) at the University of Colorado in the USA, on a Fulbright scholarship (1993-1995). In 1991 he joined Joannou & Paraskevaides, assigned to oversee the IT systems at the company's branch in Benghazi, Libya. In 1995, upon his return to Cyprus from his studies in the US, he joined IBM Cyprus, where for the next 6 years he worked in sales. In 2003 he was the first employee hired by Microsoft in Cyprus, entrusted with developing the company's operations in the country. After five years of rapid growth, his duties expanded to the position of Managing Director for Microsoft Cyprus and Malta, while in November 2011 he was appointed Public Sector Director at Microsoft Central & Eastern Europe, with the mandate of developing the company's operations in 24 countries. In addition, in 2008 he was appointed by the Council of Ministers as a member of the Board of Directors of the Cyprus Investment Promotion Agency (CIPA), a position he held until November 2011. In 2009 he was also appointed as a member of the Board of Directors of the Natural Gas Public Company (DEFA), a position he held until his appointment as Minister of Commerce. He is married to Christiana and they have two daughters. 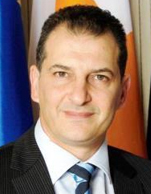 Mr. Lakkotrypis assumed office as Minister of Commerce, Industry and Tourism on March 1st 2013.